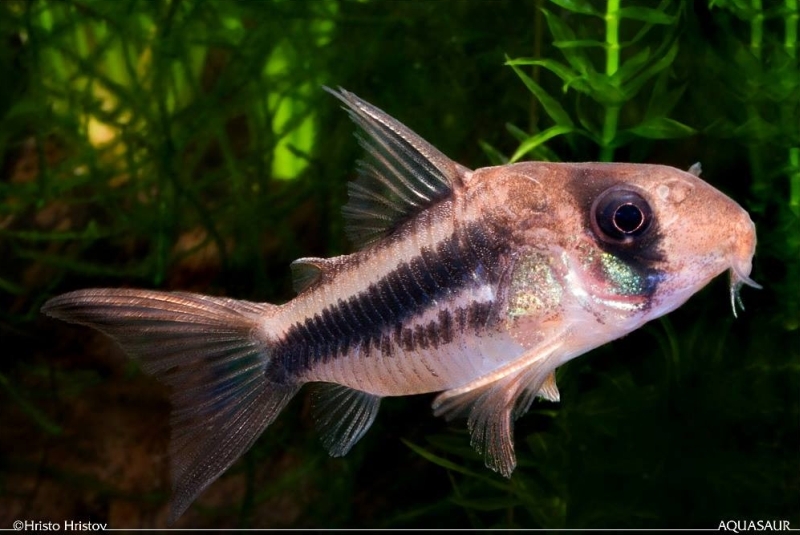 Corydoras: from the Ancient Greek κόρυς (korus), meaning ‘helmet’, and δορά (dora), meaning ‘skin, hide of an animal’, in allusion to the rows of bony plates on the flanks of genus members. axelrodi: Named for Dr. Herbert Axelrod. Type locality is ‘Río Meta, Colombia’, and this species is apparently endemic to that drainage although precise locality details are scarce. There appears to exist evidence to suggest that the type locality is situated in the Río Manacacias basin, Meta Department, near the municipality of Puerto Gaitan. The Meta flows through Colombia, forming the border with Venezuela in its lower reaches before flowing into the Río Orinoco at Puerto Carreño. Ideally use a substrate of fine sand, although rounded gravel is an acceptable alternative provided it’s kept scrupulously clean. Other décor is largely down to personal choice, but some cover should be provided to give the fish security. Corydoras spp. are foraging omnivores and will accept most sinking dried foods, as well as small live and frozen varieties such as bloodworm, Tubifex, etc. Feeding a varied diet will ensure the fish are in optimum condition. Under no circumstances should they be expected to survive on ‘left-overs’ from other inhabitants of the aquarium or relied on to ‘clean’ the aquarium. Peaceful and gregarious. Should be maintained in a group of at least 4-6 individuals. Females tend to grow larger, and sexually mature individuals are noticeably rounder and broader-bodied than males, especially when gravid. 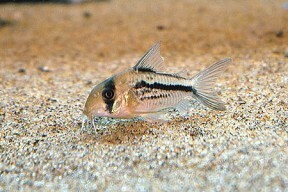 Can be bred in a similar fashion to many other Corydoras species. Use a ratio of 2 males per female if possible, and when the females are visibly full of eggs perform a large (50-70%) water change with cooler water, and increase oxygenation and flow in the tank. Repeat this daily until the fish spawn. Eggs are normally deposited on the aquarium glass, but it’s recommended to provide alternatives in the form of fine-leaved vegetation or fine spawning mops. Once spawning is complete either adults or eggs should be removed; the latter can usually be rolled gently up the glass with a finger. The new container should contain the same water as the spawning tank and be similarly well-oxygenated. Most breeders add a few drops of methylene blue, or an alder cone or two at this point in order to prevent the eggs developing fungus. Incubation is normally 3-4 days and once the fry have fully-absorbed their yolk sacs they are able to accept small live foods such as microworm, Artemia nauplii, etc. They seem less susceptible to ailments when maintained over a thin layer of sand rather than in a bare-bottomed arrangement. This species is somewhat variable in appearance and can have between 1-3 dark lateral stripes on each flank, for example. It’s also known by the alternative common name ‘pink corydoras’. It looks similar to the congener C. loxozonus plus unidentified fishes which have been assigned the codes C003 and CW021, and all four are sometimes traded under the fabricated names C. ‘deckeri‘ or C. sp. ‘decker/deker’. Unfortunately we haven’t yet seen the original description, but in general it can be told apart from C. loxozonus by the act that the principal dark lateral stripe is located around midbody whereas in in C. loxozonus it’s mostly restricted to the upper portion of the body. The stripe commences below the dorsal-fin origin and terminates at the lower caudal-fin lobe in both species. In C003 the central stripe commences at midbody but is relatively narrow and generally broken down into a series of blotches, while in CW021 the stripe commences anterior to the dorsal-fin origin and there tends to be a second shorter, narrower stripe running parallel below it. Both stripes are solid whereas when a second or third stripe is present in C. axelrodi it’s usually broken into blotches. The genus Corydoras is among the largest catfish groups and currently contains over 150 valid species. It is included in the family Callichthyidae, of which members are often referred to collectively as ‘armoured’ or ‘mailed’ catfishes group due to the presence of bony plates in place of scales on the body. Their taxonomy can be confusing, and numerous undescribed species are also thought to exist. Fish of unconfirmed identification entering the aquarium hobby are therefore typically assigned a ‘C‘ or ‘CW‘ number for purposes of reference and organisation. They are facultative air breathers and possess a modified, highly vascularised intestine which has evolved to facilitate uptake of atmospheric oxygen and aid survival in oxygen-deprived environments. In the aquarium you’ll occasionally see them rising to the surface to take in gulps of air. The stiffened pectoral-fin spines are capable of piercing human skin and a ‘sting’ can be very painful indeed, so care should be exercised when handling them. It is thought that secretions from the axillary glands at the base of each spine may even be mildly toxic or venomous. Corydoras axelrodi, ein neuer Panzerwels aus Columbien (Pisces, Teleostei, Callichthyidae).